In honor of our move into the Pioneer Log Cabin we would like to share a bit about the history of our new home! Louisville architect Brinton B. Davis, who designed numerous buildings on campus between 1909 and 1939, was enlisted to design the cabin. After years of planning and sporadic construction, the cabin was completed by 1939. Although it was originally intended for use as an extension of the Kentucky Museum highlighting and celebrating pioneer life, the cabin was never used as such. Rather, it was put to use first as overflow office space, and then as staff, faulty and international student housing. After restoration in 2004, the cabin came into the hands of the Folk Studies Program and for the last 9 years it has been used as event space, student work space, and an intimate concert venue. The latest work on the cabin was the sanding and refinishing of the floors, uncovering the beautiful natural color of the poplar floor boards (check out the before and after pictures on our Facebook page). 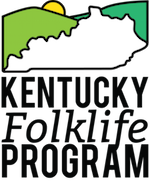 We are thrilled to now be putting the cabin to use as the offices and event space for the Kentucky Folklife Program. For more detailed information about the cabin’s construction and history, read the full NRHP Registration form.